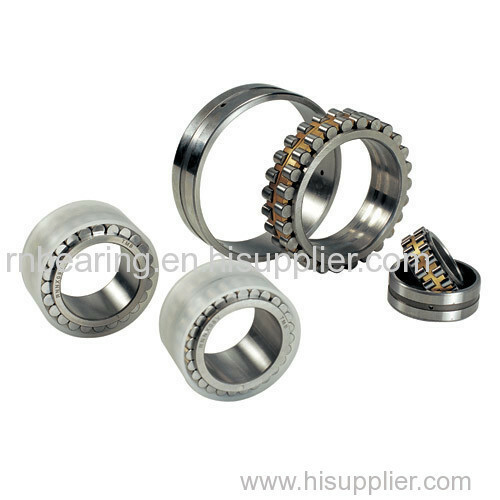 Since the rollers of the cylindrical roller bearings make line contact with the raceways, these bearings can support heavy radial loads and are suitable for high speed operation. Assembly and disassembly are comparatively easy even if the inner or outer ring requires a shrink fit, as the bearing is a separation type. Type NU: It has ribs on the outer ring and the inner ring can be separated from :the arranged set of outer ring,rollers and cage:. Type N : It has ribs on the inner ring and the outer ring can be separated from :the arranged set of inner ring,rollers and cage:. Type NJ : It has ribs on the inner ring and a rib on the inner ring. Type NF : It has ribs on the outer ring and a rib on the inner ring. Type NUP : It has ribs ring on the side of the inner ring where it did not have a rib.